Nestled with love in the Chamoli district of Uttarakhand, the sacred town of Joshimath spreads its celestial aura in the entire Garhwal region of Uttarakhand. The town of Joshimath is also nicknamed as Jyotirmath and is the winter seat of Lord Badri, whose idol is brought down from Badrinath temple to Vasudeva temple at Joshimath. This holy town is revered by the Hindus for being an important pilgrimage centre of the country. Where religion and dharma are considered as the two main elements of one’s life, the Joshimath temple enshrined at the Joshimath town restores our faith in the divine energy. Every year many devotees flock here to pay obeisance at the 8th century Jyotrimath math or the Shri Shankaracharya monastery, manifested in the town itself. It is one of the four maths or monasteries that were established by Adi Guru Shankaracharya in the 8th century AD. One can see Kalpvriksha, the oldest tree of India which is believed to be 1200 years old and visit the other noticeable Hindu shrines that are located in the city. Among the important attractions of Joshimath includes a temple dedicated to Narashima, an incarnation of Lord Vishnu. Some other temples are dedicated to Hanuman, Gaurishankar, Ganesha, and Naudevi and Surya. During winters, the town becomes home of the Lord Badri, whose idol is brought down from Badrinath temple to Vasudeva temple at Joshimath. 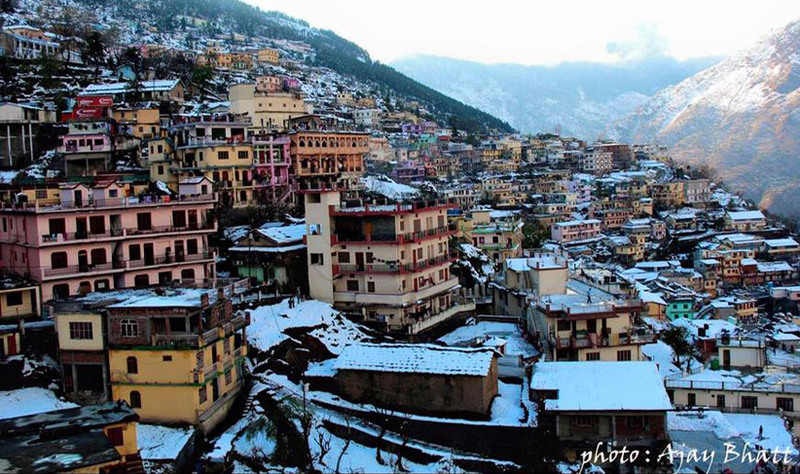 Joshimath is being turned into a major winter travel destination as the government introduced winter chardham Yatra. The tinsel town of Joshimath is also popular as a hill station as it seated at an elevation of 1,890 metres above sea level. Also, the two mighty rivers, the Alaknanda and Dhauliganga meet at the confluence of Vishnuprayag overlooking the town of Joshimath. And the view of Hathi Parvat and other Himalayan Peaks is mystifying. It is also the gateway of many Himalayan expeditions, trekking trails, camping and pilgrimage centres. Trekking: Apart from climbing expeditions, several treks to nearby valleys commence at Joshimath. The famous Valley of Flowers trek starts at Govindghat which is only 26 kms from Joshimath. Apart from that, adventure enthusiasts can visit Auli meadow in summer. 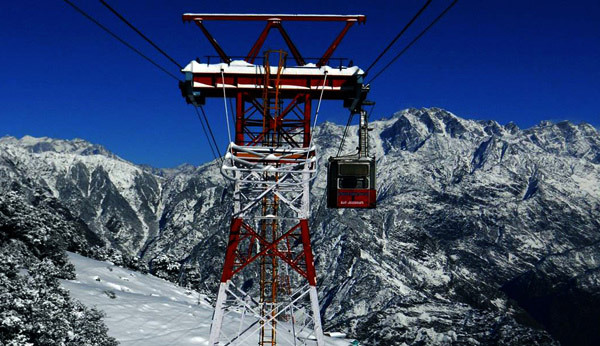 Skiing in Auli: A cable car takes one from Joshimath to Auli Ski Resort where both amateur and professional skiers can ski in snow slopes during the winter season. One can also try certification courses that have duration from 4 to 14 days. Camping: Camping is another activity where tourists can stay in camps under clear night sky. Tents can be availed on rent or can be brought by the tourists themselves. There are plenty of level ground close to nature where one can set up camps in the company of his family and friends. Advantage of booking room at Joshimath - one can easily visit Badrinath as well as Auli Ski Resort from Joshimath without much difficulty. During monsoons, make sure to check with local authorities, tour guides or tour operators about the weather and road conditions before you start your trip. During winters, the deity from Badrinath is brought to Vasudeva temple in Joshimath. Pilgrims can thus seem blessings from lord Vishnu in winter as well. Due to its proximity to holy shrine of Badrinath which sees thousands of pilgrims, many hotels and guesthouses have mushroomed at Joshimath in recent years. As a result, there is plethora of accommodations available at Joshimath. From budget guesthouses to luxurious hotels, Joshimath has it all. In fact,during peak season, pilgrims tend to stay at Joshimath as finding a place to stay at Badrinath is very difficult. There are plenty of local restaurants pepper all over Joshimath that would offer delicious North Indian dishes and popular Chinese items. Apart from that, several luxurious hotels and resorts have in-house restaurants that serve variety of cuisines according to the guest’s choice. You will also find few places offering South Indian delicacies as well. The holy town of Joshimath was established by the great Hindu philosopher and guru, Adi Shankaracharya in the 8th century C.E. To promote the Hinduism, Adi Shankara ensconced the four cardinal 'mathas' or monasteries in different parts of India, among which Joshimath or Joyotirmath was the first ever northern monastery of India. According to the local legend, when the right hand of the idol adorned in the Narasimha temple of Joshimath, will become as fine as a hair, the two mountains Jay-Vijay, en-route Badrinath will become one. During this phase, Lord Badri will disappear from the Badrinath temple and will re-appear in the form of a black stone (Shaligram) at Bhavishya Badri, located at a distance of 10 km from Joshimath. Adi Shankara had also laid the foundation of the temple of Lord Narasimha, the presiding deity of Joshimath which is believed to be one of the ‘Divya Desams’, the 108 temples of Lord Vishnu revered by the 12 Tamil poet-saints or Alvars. In ancient scriptures Joshimath is described as Kartikeyapura as it has been named after Kartikeya, the God of Katyuri kings and the son of Lord Shiva. The town of Joshimath serves as the base for the trekkers heading to the upper region of the Himalayas. The ravishing Valley of Flowers can be easily accessed from here by commencing a trek from Joshimath town. The visitant need not worry about accommodation as there are several hotels and Dharamshalas located in the periphery of the town. Joshimath is also the entrance point of Malari and Niti Valley, which has the striking resemblance to the vegetation and mountains of Leh-Ladakh and Spiti region. Don’t miss this place at any cost as you can experience some of the adventure sports activities as the hill station of Auli is located only 16 km away from here. Here you can try your hand in ice skiing, ice skating and much more. Also, the Nanda Devi Biosphere, a UNESCO World Heritage site can be easily accessed from here as it is located near Joshimath. What is Joshimath famous for? Joshimath is famous among tourist as Pilgrimage and Trekking. Joshimath is recommended destination for Corporates, Family and Kids, Foreigners, Groups, Solo. Joshimath is popular destination for following activities/ interests - Adventure, Base Camp (Trek), Business Hub, Char Dham Route, Hill Station, Others, Pilgrimage, Temples, Winter Char Dham.